Celebrities are constantly reinventing their look. From drastic chops to playful fringe, A-listers never stick with the same style for very long—and neither should you! 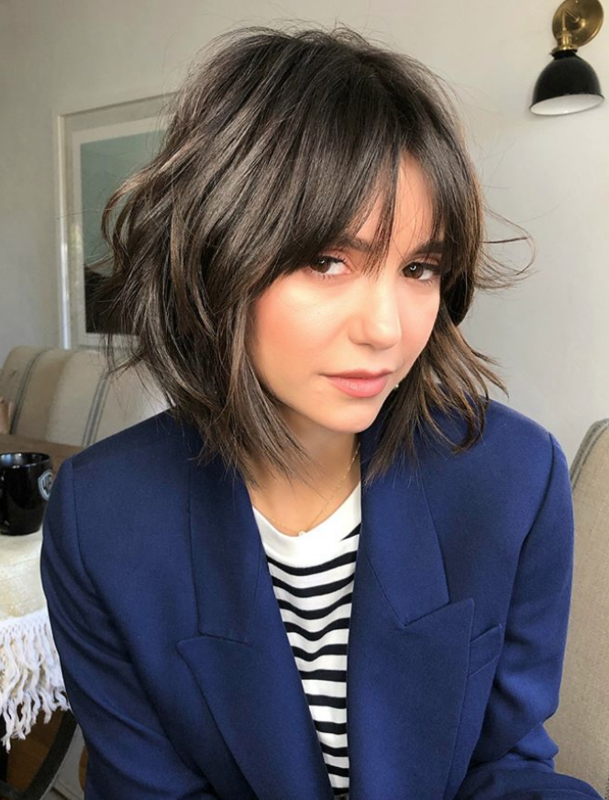 Check out the top celeb styles we’re loving at the moment, plus must-have product picks designed to give your hair major texture this season. Eager for a fresh start this season? Follow “I, Tonya” star Margot Robbie’s lead with a blunt textured bob. With minimal volume and high shine, the edgy cut looks effortless, modern and perfect for winter. The key to the look? A subtle bend, not a wave, and soft texture. Want to go lighter? Actress Jessica Biel transformed her signature chocolate shade into a soft honey blonde hue. The gorgeous balayage and effortless texture give Biel’s locks a fresh, beachy feel that will look even better during the summer months. The “Vampire Diaries” alum’s shag cut may give off a cool, retro vibe, but this style is anything but dated. Choppy layers, piecey fringe and effortless texture add a playful, modern edge to the throwback look. The model may have seemingly transformed her signature California blonde locks overnight, but, surprise— the platinum look is actually a wig! Despite being a temporary ‘do, Baldwin’s blunt bangs, subtle texture and white blonde hue are providing major hair inspiration. Our advice? Don’t expect to go this blonde overnight. If you’re determined to go platinum, start gradually lightening your hair to minimize damage. Eager to follow their lead? Whether you want to go lighter, shorter or bolder, make sure to stock up on these essentials to perfect any texturized look. Add texture—and disguise greasy strands—with this lightweight dry shampoo. Perfect for amping up effortless waves, this product restores volume, absorbs oil and provides a cool, matte finish. No matter what hair length you’re working with, this product adds texture, volume and lift to any style. Apply it to hair before blow-drying, then follow with Keune Blend Sea Salt Spray for even more beachy texture. Keune, for the salon professional since 1922. To learn even more about their brilliant color, stunning styling, and trend inspiration be sure to stalk Keune on Bangstyle and follow them on Instagram, Facebook, Twitter, and Pinterest! The great thing about hair accessories is their ability to transform your style from understated to exquisite in an instant. They can show off your hair colour by providing contrast, accentuate your cut by altering your style and step up your look if you’re having a bad hair day. They were first spotted on the runways at shows like Chanel, Zadig & Voltaire, Versace, Zimmerman, and Alexander Wang and have continued to be a hit with both social and celebrity starlets alike. If you haven’t donned a hair accessory since the days you bought butterfly clips from Limited Too, your regimen may need a little updating. Keep reading to learn all the best ways to add hair accessories to your style! When it comes to color, toning is an ideal tool for any shade. From being a stylist’s lifesaver to giving the client exactly what they’re looking for, toners allow for artistry and freedom behind the chair. Whether you’re correcting tone or achieving fashion-forward shades, toners are often the key to getting what you need quickly. Knowing that time in the salon is precious, Matrix has made the process that much quicker. With their latest releases — Color Sync Sheer Acidic Toners and Color Sync 5-Minute Fast Toners—they complete the stylist’s “Toning Toolbox” giving them the power to tone, pre-tone, refresh, neutralize and gloss even the most compromised strands.